Nowhere has there ever been a course that was a must play course than the Old Head of Kinsale. Located just outside the fishing port of Kinsale Town this majestic course is situated 250 feet above the sea! Views of at least 50 miles all round and a course to match the feeling of a state of awe comes to mind. 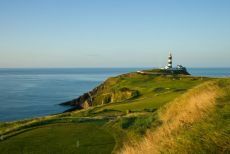 With the Sun shining the wind at your back and the course in front of you then you are truly on the path to Heaven at the Old Head of Kinsale. The images are just stunning, the course unforgettable, the people at Kinsale a delight, the food a must and you going there is without question. I sum up this course from a client who I played the Old Head with as the last course of his trip to Ireland. Old Head of Kinsale Green fees are 200 Euros a person for 2013 season High Season. Or conbine both course with Ballybunion andOld Head of Kinsale Vacation Packages.